"The season of witches and ghosts...Halloween is the perfect time of the year to head back out on the road, continuing the non-stop power of our performances," Graves says. "I'm especially looking forward to meeting and interacting with all my fans from every corner of the globe. 2019 has me headed back to Europe after an amazingly successful romp across the continent last year which left everyone wanting more. So, as promised, here we come!" 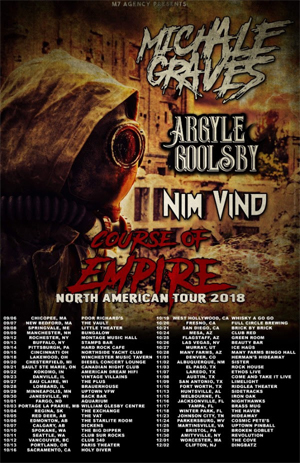 Since 1995, Graves has toured to numerous countries, playing hundreds of shows, all the while paving his way through the Punk Rock scene worldwide. Michale Graves continues to take his artistry to the next level, with every project he's shared to the world being nothing short of moving and inspiring. 10.10 Big Dipper / Spokane, Wash.
10.11 Club Sur Rocks / Seattle, Wash.
10.13 Paris Theatre / Portland, Ore.
10.16 Holy Diver / Sacramento, Calif.
10.19 Whisky A Go Go / West Hollywood, Calif.
10.20 Full Circle Brewing Co / Fresno, Calif.
10.21 Brick By Brick / San Diego, Calif.
10.24 Club Red, Mesa, Ariz.
10.25 Green Room / Flagstaff, Ariz.
10.26 Beauty Bar / Las Vegas, Nev.
10.28 Many Farms Bingo Hall / Flagstaff, Ariz.
11.01 Herman's Hideaway / Denver, Colo.
11.02 Sister / Albuquerque, N.M.
11.13 Side Tracks Music Hall / Huntsville, Ala.
11.15 Iron Oak Post / Melbourne, Fla.
11.16 Nighthawks / Jacksonville, Fla.
11.17 Brass Mug / Tampa, Fla.
11.18 The Haven Lounge / Winter Park, Fla.
11.21 Hell at The Masquerade / Atlanta, Ga.
11.23 The Hideaway / Johnson City, Tenn.
11.24 Cosmic Pete's / Parkersburg, W.V. 11.25 Uptown Pinball / Martinsville, Va.
11.29 Broken Goblet Brewery / Bristol, Pa.
11.30 Revolution Bar & Music Hall / Amityville, N.Y.
Michale Graves kicked in the door of the music scene in 1995 as the lead singer and songwriter of one of the most legendary punk rock bands of all time, THE MISFITS. For nearly two decades Michale Graves has been entertaining, influencing and informing a growing audience world-wide. His journey as an artist has ignited a passion. A passion that motivates his desire to reach out, create a dialogue, and build a platform to discuss and interact on pop-culture, people, and the world around us. Driven by the pursuit of quality and harmony in everything that he is involved in, Michale travels the world and looks into the eyes and hearts of tens of thousands of fans.